News reports coming out of India have noticeably focused on the greater devastation in Nepal, yet the states of Bihar and Uttar Pradesh in India, along with Sikkim were also close to the epicenter of the quake, and were rocked hard. 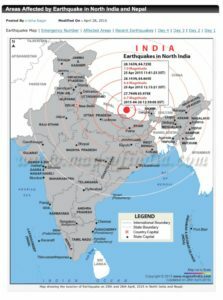 (See map – http://www.mapsofindia.com/mapinnews/areas-affected-by-earthquake-in-india/) In India, besides Delhi and Agra, the tremors were also felt in Lucknow and Jaipur. And in Bihar, where more than 50 people died in yesterday’s earthquake, the after tremors were pronounced and went on for several minutes. According to www.IndiaToday.intoday.in, at least 44 people were killed and 237 injured in various parts of India in a powerful earthquake, with epicentre in Nepal, which destroyed or damaged several houses and buildings. 30 were killed and 81 injured when a roof and wall collapsed in Bihar after the high intensity earthquake. 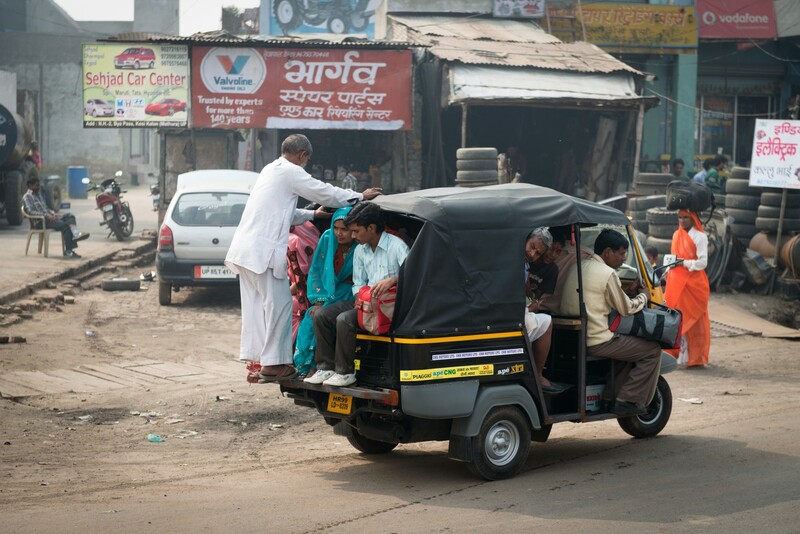 Earthquake aftershocks (and damage in Northern India) were felt as far away as AGRA, India. Rescue teams have fanned out to several parts of Bihar, especially in the East Champaran district, which has been hit the worst. Several villages have been flattened by the quake, and women and children continue to live in makeshift tents. However, medical teams have managed to reach some of these troubled spots. “Fuel is needed the most to transport the survivors and those injured to hospitals and safer places. 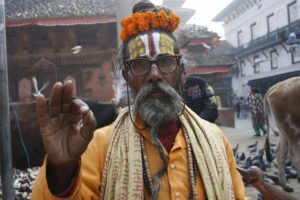 So far, it is proceeding well but there is a huge influx of people who have reached the Indian border at Raxaul from Nepal,” said Pradhan. Bihar’s principal secretary in charge of disaster management, Vyas Ji, said that special trains were being put into service to evacuate people living in the vulnerable areas along the border between Nepal and Bihar. India is working on an earthquake Early-Warning System to better predict and warn citizens about pending earthquakes. According to B K Rastogi, Director General, ISR, this earthquake prediction and early warning system will be the country’s first such full fledged center. Three people also died in three districts in Bangladesh due to the tremors following the powerful earthquake. According to Senior Scientist Sankar Kumar Nath of IIT Kharagpur, a quake of magnitude 9 is a big possibility. “We are actually lucky that only a 7.9-magnitude earthquake has come. I would be very happy to have a few 7.9-magnitude earthquakes than a 9-magnitude earthquake which would be absolute disaster. The trouble is that in terms of energy release, which is what causes the damage, it would take 40 to 50 earthquakes of magnitude 7.9 to avoid an earthquake of magnitude 9,” he told Indian Express. Bihar Affected Areas – Patna district, Samastipur, Bhagalpur districts, Bhita, Supual, Darbhanga, Muzaffarpur, Gopalganj. Uttar Pradesh Affected Areas – Kanpur, lucknow, allahabad, Agra, Varanashi, Jhansi, Sonebhadra, Gorakhpur. West Bengal Affected Areas – Kolkata, Lake Town, Salt Lake, Dalhousie, Darjeeling/Siliguri, Park street area, Telipara, Purulia, Bankura, Burdwan, East Midnapore and Nadia district. Other Cities – New Delhi, Noida, Chandigarh, Jaipur, Barmer, Dumka, Pakur, Sahibganj, rishikesh, Ahmedabad, Ranchi, Jamshedpur, Bhubaneswar, Visakhapatnam, Srikakulam, East Godavari districts, Kochi, Nagpur and Jabalpur, Jafar Nagar, Jaripatka, Bhopal, Gwalior, Mandla, Hoshangabad, Sidhi, Indore, Chhindwara and Shahdol among other districts.